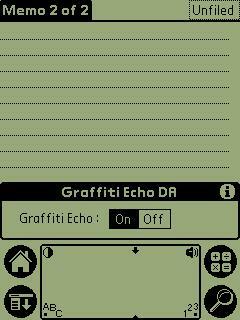 GraffitiEchoDA is for Handera 330, and is freeware. GraffitiEchoDA controls Graffiti echo in silk screen. You can download this program from PalmGear HQ also. To run this application, you need DA launcher such as EasyLaunch. If you want to know more about DAs, please visit: http://member.nifty.ne.jp/yamakado/da/.